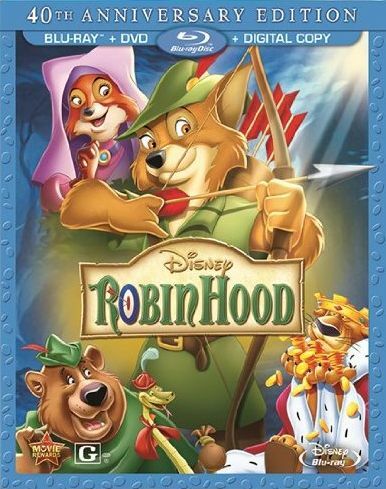 Robin Hood is a classic character that robs from the rich and gives to the poor, and he does the same in Disney's version of Robin Hood, though here he's represented by an anthropomorphic fox. His love interest, Maid Marian, is also a fox, while his best friend Little John is a bear, Friar Tuck is a badger, the evil Prince John is a lion, and the Sheriff of Nottingham is a wolf, though I really didn't think he looked much like a wolf. The voices given to these characters were undoubtedly good, as one would expect from a Disney production. I recognized the voice of Little John the bear as being the same voice as Baloo the bear from Disney's The Jungle Book. The plot... well, the plot in this film is really thin, as in there isn't much of one. Robin and Little John don disguises and rob the evil Prince John as he's traveling along a forest road, and this is where we find out that Prince John's minion, Sir Hiss, had hypnotized King Richard to make him leave on the crusades and leave his brother in charge of the kingdom. Then the Sheriff of Nottingham taxes Friar Tuck and a family of rabbits, but Robin (once again in disguise) gives them back money, and also gives a rabbit kid, Skippy, an bow and arrow. Skippy and his friends go to play with his new bow and arrow and winds up shooting the arrow in a courtyard where Maid Marian is playing badminton, so they all meet and find out that Maid Marian and Robin Hood used to be childhood friends and are in love with each other despite not having seen each other in years. Next, Prince John decides to set a trap for Robin Hood in the form of an archery contest, and of course Robin participates and escapes. So when Friar Tuck gets mad at the Sheriff, he's taken into custody and another trap is set for Robin Hood. Though this trap makes a lot more sense than an archery contest just to win a kiss from Maid Marian. Anyway, so that's the basic plot. Not much character development or overcoming extreme challenges or anything. Oh, and it's a musical so there are songs thrown in, and some of them were actually pretty good. The film was made in 1973 so it does have that classic Disney animation look to it; no fancy CG here! But the classic animation is a nice change of pace from all the modern animated films and TV shows I've seen recently. And both the Blu-ray and DVD look and sound beautiful, very crisp picture and clear sound, so they definitely did some enhancements to make it look and sound so nice. The Blu-ray + DVD + Digital Copy pack includes a Blu-ray, DVD, and a DVD that contains a digital copy that you can put on your computer or portable media device. There are also a bunch of extra features including an alternate ending, a deleted storyline, and a bonus short called "Ye Olden Days". The alternate ending and deleted storyline are both storyboarded, not animated, so that was a bummer, but still worth checking out. The deleted storyline involves Prince John setting up yet another trap for Robin Hood, so I think it was wise to cut it from the film. This is a nice looking classic Disney film with voices that are pleasant to the ears, but the lack of a solid story really hinders it from being a great film. If you haven't seen it before then I'd say rent it, and if you already own it on DVD then there's no reason to pick this up unless you really want it on blu-ray.